What is Linney's Latin Class? Linney's Latin Class is a free online Latin class provided as service/ministry to the homeschooled and self-taught communities. Greetings from William E. Linney, author of the book Getting Started with Latin. 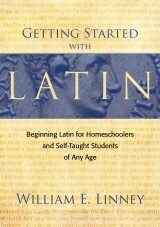 People seem to like Getting Started with Latin, which is a very step-by-step introduction to Latin designed for homeschoolers and self-taught students. But since it only covers the beginning stages of Latin grammar, many readers started asking for some kind of follow-up book...that is, something to do after completing Getting Started with Latin. So that's why I started working on this lecture series. Linney's Latin Class is a real Latin class with a real textbook. Therefore, before you start these lectures, let me recommend that you first go through my beginning Latin book called Getting Started with Latin. This book will give you a basic introduction to Latin grammar, giving you a good foundation for the study of Linney's Latin Class. Of course, you don't have to do this, but it will make it much easier for you to get started in this whole process. Click on the book's cover to go to the Getting Started With Latin website, or click here to go straight to the page where the book is sold on Amazon.com. This online Latin class consists of a series of free recorded lectures in MP3 format. These lectures take the listener through a Latin textbook called The First Year of Latin by Gunnison and Harley (1902 edition). So to participate in Linney's Latin Class, you will need to get the textbook, download the lectures, and listen to the lectures. You will probably want to get a notebook of some kind to do your work in. The textbook for this class, called The First Year of Latin, is over 100 years old. If you wish, you may download the book in PDF format from Google Books. Click here to view the textbook at Google Books. Other folks want to have a real paper book to hold in their hands, make notes in, etc. The textbook costs approximately $15, and you can order it from any of the main online booksellers. Click here to order the book from Amazon.com. Click here to order the book from Barnes and Noble.com. Or, if you live in the UK, click here to order the book from Amazon.co.uk.